News | Metrobank Foundation hosts dinner for new AFP chief - Federal Land, Inc. News | Metrobank Foundation hosts dinner for new AFP chief - Federal Land, Inc. Newly appointed Armed Forces of the Philippines (AFP) Chief of Staff and 2007 Metrobank Foundation Outstanding Filipino, General Carlito Galvez, Jr. (2nd from left) with wife Marissa Galvez (3rd from left) pose for a photo together with Federal Land chairman and MBFI vice chairman Alfred Ty (leftmost) and MBFI president Aniceto Sobrepeña (rightmost) during the testimonial dinner held at the Grand Hyatt Manila. 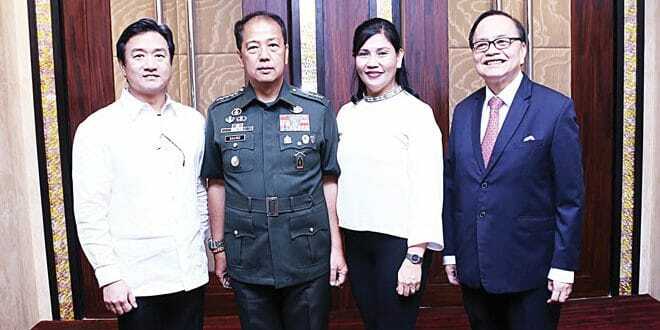 To honor newly appointed Armed Forces of the Philippines (AFP) chief of staff General Carlito Galvez, Jr. a testimonial dinner was hosted by the Metrobank Group at the Grand Salon of Grand Hyatt Manila in Taguig City. General Galvez was a recipient of the 2007 search for The Outstanding Philippine Soldiers (TOPS), now widely known as the Metrobank Foundation Outstanding Filipinos. Present during the dinner were wife Marissa Galvez, Federal Land chairman and MBFI vice-chairman Alfred Ty and MBFI president Aniceto Sobrepena.